Click Here - To see how Chowan County evolved each decade - includes all the known towns and villages. Click Here - To view the significant Education events for Chowan County since the county was formed. Click Here - To see the known battles/skirmishes in Chowan County during the American Revolution. Click Here to go to the official website of the Chowan County government. Click Here to learn more about the known airports in Chowan County. Chowan was created in 1668 as a precinct of Albemarle County. In was named in honor of the Indian tribe Chowan, which lived in the northeastern part of the colony. 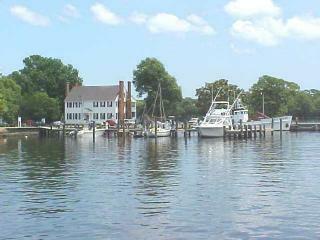 In 1722, Edenton, which was named in honor of Governor Charles Eden, was established. It was designated as the county seat and has been ever since. For some strange reason (apparently lost to history), the Lords Proprietors decided to rename all four of the original precincts within Albemarle County around the year 1680. Chowan Precinct was renamed to Shaftesbury Precinct. However, the citizens objected and the new name was never really accepted nor used by many other than those in official capacities. By the mid-1680s, the name was changed back to the original name - Chowan - which has remained ever since. Click Here to see the approximate boundaries of the short-lived Shaftesbury Precinct. Governor Sir William Berkeley of Virginia sent an expedition to meet the Indians along the Chowan River in 1646, presumably in preparation for southernward settlement. About 1648, Henry Plumpton of Nansemond County, Virginia, just north of the Chowan region, in cooperation with Thomas Tuke and several others, bought from the Indians "all the Land from the mouth of the Morratuck [Roanoke] River to the mouth of Weyanook Creek." In 1650, a Virginia merchant, Thomas Bland, was one of a party of eight who explored the Chowan, Meherrin, and Roanoke river valleys. His petition to the Virginia General Assembly for permission to settle "to the Southward" was approved on October 20, 1650. The General Assembly instructed him and his associates to "secure themselves in effecting the said Designe with a hundred able men sufficiently furnished with Armes and Munition." In 1651, he published a promotional tract, "The Discovery of New Brittaine, 1650." In 1653, the Virginia General Assembly made a grant of 10,000 acres, in response to a petition from the Rev. Roger Green, "unto one hundred such persons who shall first seate on Moratuck or Roanoke river and the land lying upon the south side of Choan river and the branches thereof," and "to the said Roger Green, the rights of one thousand acres of land, and choice to take the same where it shall seem most convenient to him, next to those persons who have had a former grant". In a pamphlet entitled "Virginia's Cure," printed in London in 1662, the Rev. Roger Green cited the colony of Virginia as being bound "on the North by the great River Patomak, on the South by the River Chawan." By October of 1668, Chowan, Currituck, Pasquotank, and Perquimans precincts had been formed in Albemarle County. In 1738, Albemarle County as a unit of government ceased to exist. 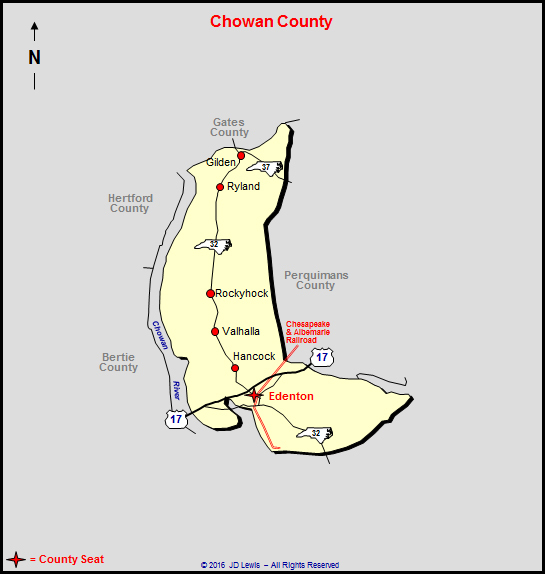 Chowan Precinct was renamed as Chowan County on March 8, 1738/9, and it has been in continuous use ever since. The first permanent English settlers in North Carolina were Virginians who heard glowing reports of fertile bottom lands, abundant timber resources, and an excellent climate. They moved into the Albemarle Sound area about 1650, purchasing land from the local Indian tribes. The Virginia General Assembly also granted land along the Chowan and Roanoke rivers to Roger Green in 1653. By 1657, Nathaniel Batts had a house at the western end of Albemarle Sound. William Edmundson, one of those early missionaries who was known as a leader of the Irish Quakers, kept a diary of his arduous travels in Nansemond County, Virginia, and in the Albemarle region in 1672. He held a worship service at the home of Henry Phillips (Phelps) for settlers in the wilderness area south of the Great Dismal Swamp. Among the early settlers who attended that first meeting were Francis Toms, Joseph Scott, Nathaniel Batts, and Hugh Smith. Phillips was eager for religious confirmation - he had been converted to the Quaker faith seven years earlier in Salem, Massachusetts, before moving to Albemarle and had not seen a minister of any persuasion since that time. His wife was Hannah Baskel, the first known Quaker woman in North Carolina. A few months after the first Quaker missionary visits, George Fox, the leader of the Quaker movement in England, came to the colonies. He held a religious meeting in Chowan Precinct, and then proceeded to Bennett's Creek (calling it Macocomocock) by canoe into the regions bordering Albemarle Sound. He made many converts among the Puritans all through the area. William Hill lived close by Henry Hill in Chowan County, but there is no indication that they were as closely related as brothers. In fact, it appears he may have come from Antigua where a William Hill, possibly his father, had settled in 1664 at Five Islands with four other Quaker Englishmen. A link with Antiguan roots is also indicated in a will, dated 1721, in which Basil Sanders willed to William Hill of Antigua title to a tract of 860 acres of land in Chowan County, on which his mother, Mary Porter, had lived. It is unclear whether Mary Porter was the mother of Basil Sanders or of William Hill, but Mary Porter may well have been the wife of John Porter, who was banished from the colony for preaching at illegal Quaker gatherings, including the gathering on the ship Blessing. The earliest of Carolina's immigrants to settle in a town clustered in the village of Roanoke - present-day Edenton - on the northwestern shore of Albemarle Sound. The commercial center of the Albemarle, Roanoke became the region's political center as well in 1710, when it became the capital of "that part of the Province of Carolina that lies North and East of Cape Fear." Renamed Queen Ann's Town in 1715, the town acquired its final name in 1722 when it was incorporated as Edenton, honoring the memory of Governor Charles Eden, who had recently died in office. William Byrd made this observation about Edenton in 1728: "They may be 40 or 50 Houses, most of them Small, and built without Expense. A Citizen here is counted extravagant, if he has Ambition enough to aspire to a Brick-chimney. Justice herself is but indifferently Lodged, the Court-House having much the Air of a Common Tobacco-House." The first permanent English settlement in the area was in 1653, established mainly by emigrants from the Virginia Colony with others from New England and Bermuda. They settled on the banks of the Chowan and Roanoke Rivers in the Albemarle Sound area in the northeast corner of present-day North Carolina. This settlement came to be known in Virginia as "Rogues' Harbor." The first actual settlement was made by Virginians near the mouth of the Chowan about the year 1651. In 1664, a civil government was organized by the settlers on the Chowan River. William Drummond was chosen governor, and the name of Albemarle County was given to the district bordering on the sound. The Church of England (Anglican) established the parish of St Paul's in Chowan County and it was organized in 1701 as the first Anglican parish in the colony under the provisions of the Vestry Act of 1701. A post-in-ground church building was erected the next year on an undetermined plot of land just east of Queen Anne's Creek on what is now known as Hayes farm; the town of Edenton would not be founded for another eleven years. In 1736, construction was begun of the present St Paul's on the town lots set aside for church and churchyard (cemetery) before 1722. Chowan County, located in northeastern North Carolina, was first inhabited by the Native American tribe, the Chowanokes, who were Algonkians. In the late 1500s, Ralph Lane, governor of the Roanoke Island colony, traveled to this area and met with Menatonon, chief of the Chowanokes. Once James Town was established in the early 1600s , the Albemarle area was basically cut off from English settlement due to the Great Dismal swamp. It was in the middle of the 1600s before English settlers were permanently moving to this area. Basically, settlers came to this area because of low taxes, religious freedom, and cheap land. Also known as Shaftesbury Precinct, it was called Chowan Precinct after 1685. In 1712, the General Assembly voted to establish a town north of the Albemarle Sound. Town lots were laid out on Queen Anne's Creek and in 1722 the town was named for Governor Charles Eden, who had recently died in office. Once Lord Granville of the Lord Proprietors placed his land agent Frances Corbin in Edenton, the town became a center of trade and very prosperous. Many of the old homes on the historic tour of Edenton and Chowan County date from the "Land Office" period. Shipping and fishing became an important industry throughout the county as well as farming. "The growing fame and prosperity of Edenton in the last year before the Revolution attracted to Chowan some of the most remarkable and gifted men of the age." (Cradle of the Colony: The History of Chowan County and Edenton, NC, by Dr. Thomas Paramore, 1967, page 26). Samuel Johnston, a "leader in Revolutionary activities in North Carolina" (Guidebook: Historic Edenton and Chowan County, 1984 edition), was a member of the Continental Congress in 1771. He was also governor of North Carolina from 1787 to 1789. Joseph Hewes, who was educated at Princeton, opened a shipyard in Edenton due to the maritime commerce in the area. He later signed the Declaration of Independence. Another famous Edenton resident was James Iredell, Attorney General for North Carolina and Associate Justice of the Supreme Court of the United States. Homes for several of these and other illustrious leaders are included on the Historic Tour of Edenton and Chowan County. In the fall of 1774, the women of Edenton took a political stand on the Tea Act. On October 25, 1774, fifty-one leading women of the Albemarle region declared their devotion to the cause of liberty by resolving to not use East India tea. This act is thought to be the earliest recorded political activity by women in the American colonies. A replica of the Edenton tea pot is located near the town green. Edenton became a vital port during the American Revolution as many of the other major ports were closed off by the British blockade and Edenton became the only place many of the supplies for Washington's army could be unloaded. The British actually thought that the harbor at Edenton was too dangerous to approach. One German visitor maintained "It was certain that no hostile vessel of any size could venture over the Bar and Swash." (Cradle of the Colony: The History of Chowan County and Edenton, NC, by Dr. Thomas Paramore, 1967, page 33). According to Dr. Paramore of Meredith College, Raleigh, NC, "...most of the American trading ships took refuge here, where they could take in or put off cargoes in security; Philadelphia merchants established themselves here; the Virginians brought thither their tobacco by land-carriage, taking in exchange West Indian or other wares, which .....were over-plentiful here." Paramore suggests, "the supply line that developed through Edenton and the Backwater wharves at South Quay became a vital life-line for Washington's army." As major ports began to open again, influence of the Albemarle area began to decline. Click Here to learn about all of the known officers and men who served in the Chowan County Regiment of Militia during the American Revolution. All names in "blue/underscore" can be clicked on for additional information. Even though there was a post-war slump at the end of the Revolution, Edenton still participated in the shaping of the nation. Dr. Hugh Williamson, surgeon-general for the North Carolina troops and Edenton resident, attended the 1787 Constitutional Convention at Philadelphia. As an advocate of the federalist position that a stronger authority in government was necessary, he supported constitutional proposals calling for more power for the national government. He signed the Constitution for North Carolina and returned home to help with endorsement by the state. Edenton also figured in Civil War events. In recent years, research has revealed that the autobiographical account of Harriet Jacobs, Incidents in the Life of a Slave Girl, actually took place in Edenton. Originally thought to be abolitionist propaganda written prior to the Civil War, the account of Jacob's hiding in surrounding swamps and in a house near the downtown area for almost seven years, is now part of Edenton's history on the History Tour of Edenton and Chowan County. Click Here for more history of Chowan County. Link is current as of January 2019. Click Here to view / download an Adobe PDF file of the book, entitled "Economic and Social History of Chowan County, North Carolina, 1880-1915," by W. Scott Boyce, published in 1917. Click Here to view / download eight road maps of Chowan County.